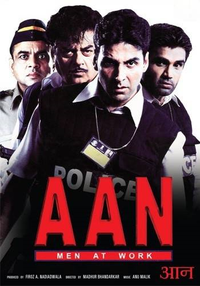 While the cop heroes sweat it out in their humid halos the men behind the scenes also make their presence felt in rapid fire motions in the emotionless picture show that is "Aan: Men At Work". I’ve heard people say that all cop films are alike? Wrong! Each filmmaker has a different perception of the real world. Aan (meaning PRIDE in english), is a good film, but not without some flaws.